The chest surgeons at the Tokuda Hospital in Bulgaria's capital Sofia have successfully performed a unique medical operation by removing a 5-kg tumor, the hospital press service announced. 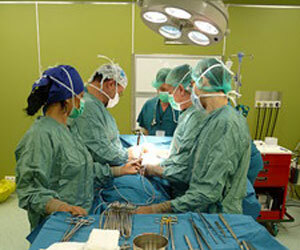 The doctors removed the tumor from the lungs of a 13-year-old boy in a challenging surgery which lasted for six hours. The whole team from the chest surgery ward of the Tokuda Hospital took part in the extremely complex medical operation which saved the boy's life. The surgery was utterly successful, and the condition of the recovering patient is improving, according to Dr. Tzvetan Minchev, head of Tokuda's chest surgery ward.